YOGI BEAR movie - it's a belter! 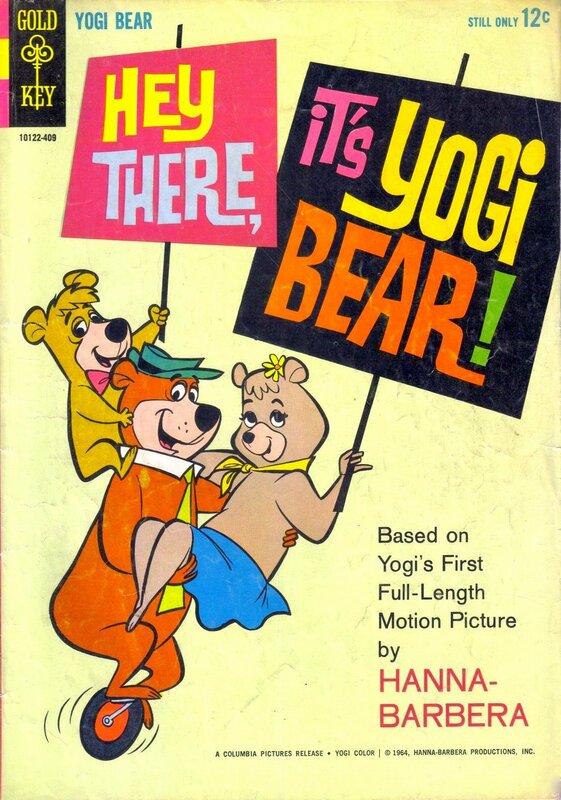 take your eyes off Yogi. 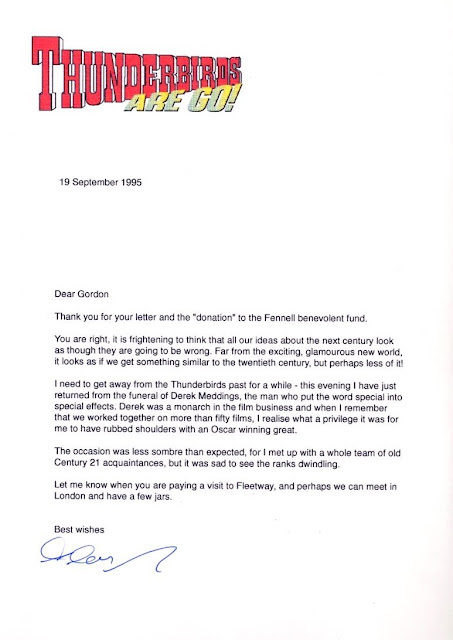 various GERRY ANDERSON TV shows and numerous other projects. a bit of money in the process. Coke in my case), but, alas, it was not to be. Alan - and the first round's on me. 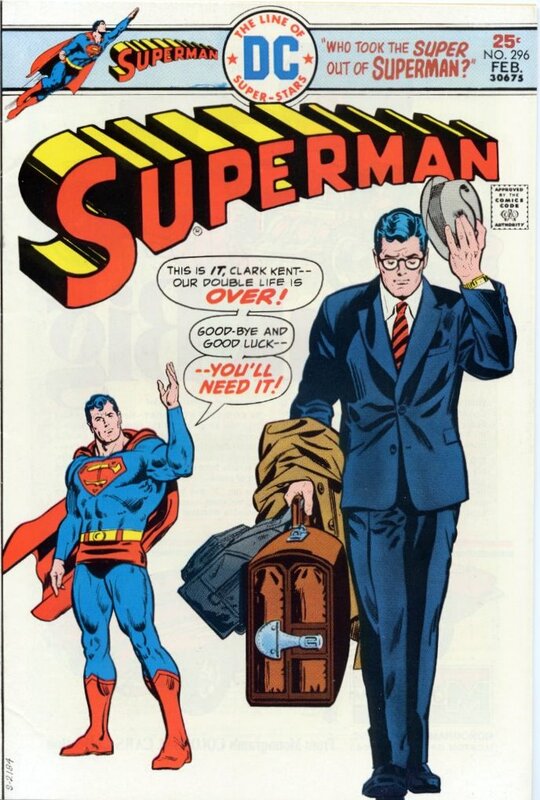 Remind me to tell you my other Alan Fennell story sometime soon. Thank you for your letter and the "donation" to the Fennell benevolent fund. 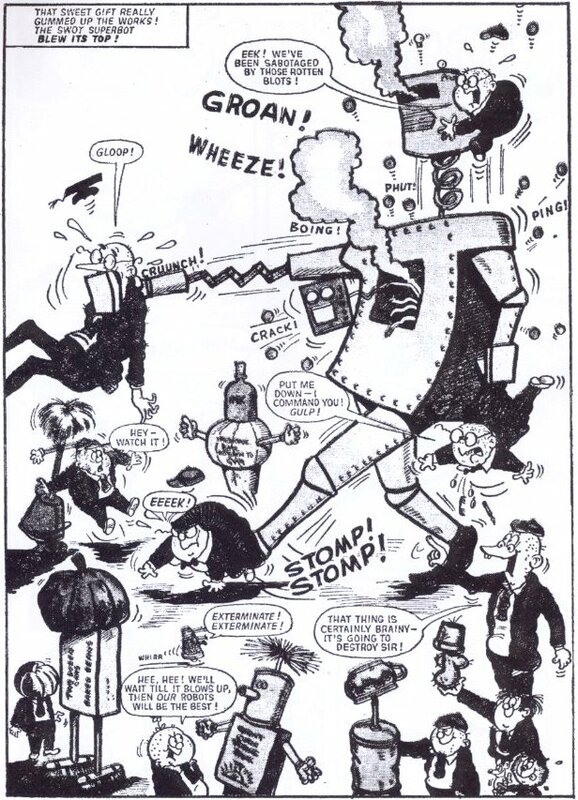 it looks as if we get something similar to the twentieth century, but perhaps less of it! to have rubbed shoulders with an Oscar winning great. 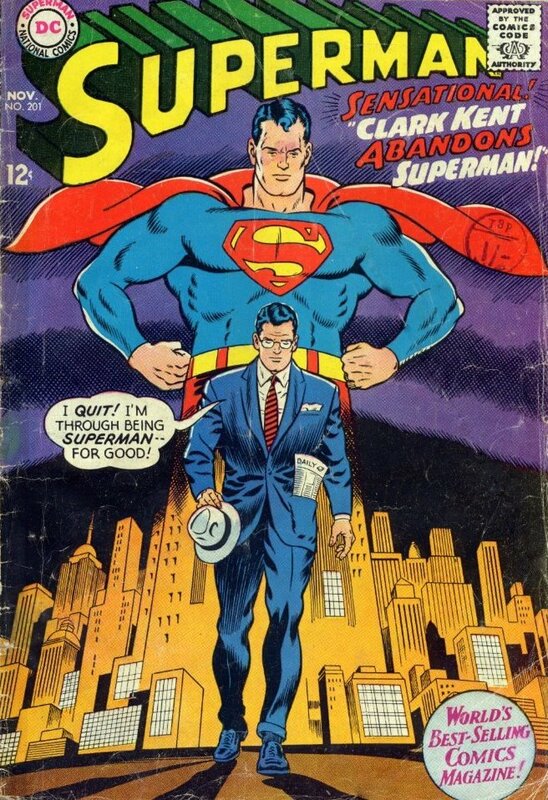 Century 21 acquaintances, but it was sad to see the ranks dwindling. London and have a few jars. For that other story mentioned above, click here. British comics and strip cartoons. me sharing it with you here. 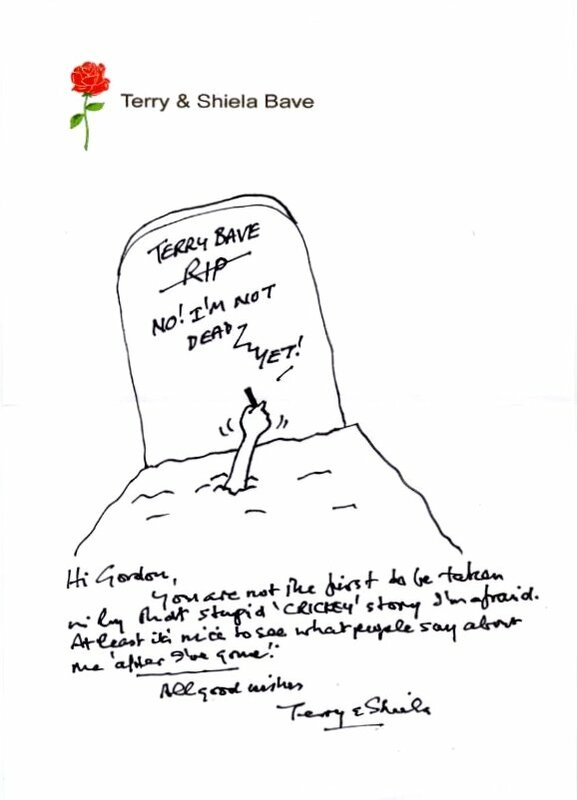 Incidentally, Terry is still with us - Crikey! isn't. in by that stupid 'CRIKEY' story I'm afraid. "GHOSTING ALONG WITH SAM'S SPOOK!" 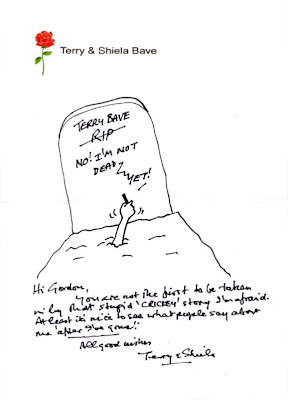 Back in 2004, famous cartoonist TERRY BAVE responded to my request for a submission to The ILLUSTRATED COMIC JOURNAL by writing the following article. The ICJ, alas, languished in limbo, so I then passed it on to CRIKEY!, who were going to print it, but ceased publication before they could. Since Terry was kind enough to write it, it seems only fair that others get the chance to read it; so here for the first time anywhere, are Terry and his wife Shiela's reminiscences about 'ghosting' for comics. All illustrations from this point on were provided by Terry himself. SHIELA and I have been creating, writing and drawing many, many children's comic strips since way back in 1967. Our break came via ALBERT 'COS' COSSER, the editor of WHAM!. He bravely handed me SAMMY SHRINK, "The Smallest boy in the World" - my 'first' of many 'ghosted' features, and one we were able to make our own. 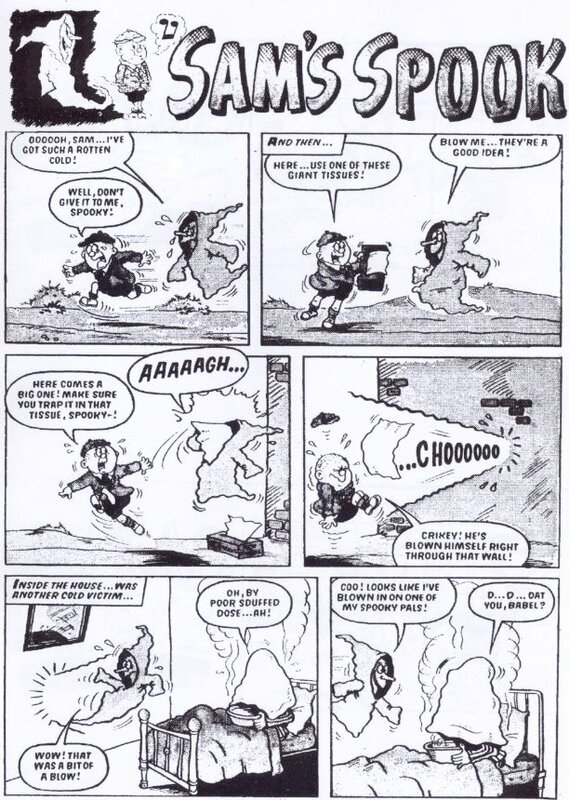 In fact, over the following years, we supplied many of the weekly scripts and drew the strip for over 20 years. SAMMY SHRINK appeared in WHAM!, SMASH!, POW!, KNOCKOUT and WHIZZER & CHIPS. 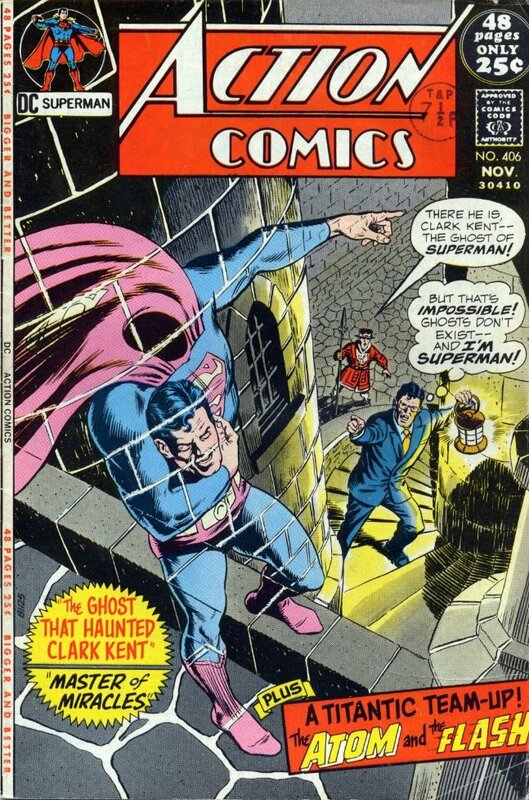 Now and again a comic artist would be called upon to 'ghost' (copy) another artist's strip on a weekly basis for a while when, for example, the regular artist was either sick or perhaps found himself in the rather enviable position of having far too heavy a workload. As each artist has his own individual style of drawing, it was important to 'ghost' that particular style as closely as possible. 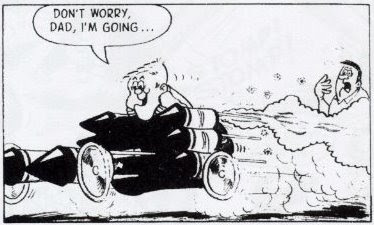 With luck, and if the Editor showed willing, over a period of time it would be possible to 'make the strip your very own' by gradually introducing your own distinctive style of drawing. This didn't happen too often, and certainly not in the short term. 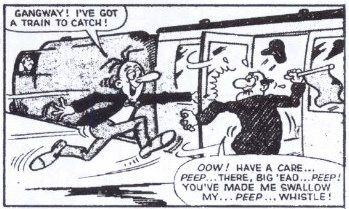 I was very lucky - I found it a reasonably easy task to copy LEO BAXENDALE's basic drawing style, which appeared in WHAM!, SMASH!, and POW! at that time. 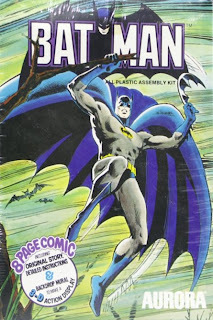 Being particularly keen to make my way in this FUN business, I jumped at the chance when 'COS' offered me the chance to create a brand-new comic character of my own. He wanted a wicked 'baby' fun character as a mascot for WHAM!, so Shiela and I came up with BABY WHAMSTER, who was quickly followed up by BABY SMASHER, the new mascot for SMASH!. 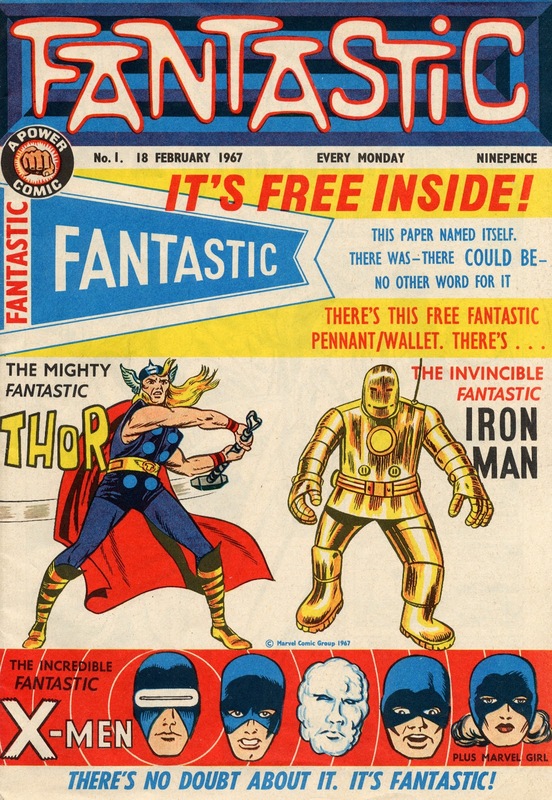 We supplied scripts and artwork for both babies, who were very successful in their respective comics, and later appeared in both WHAM! 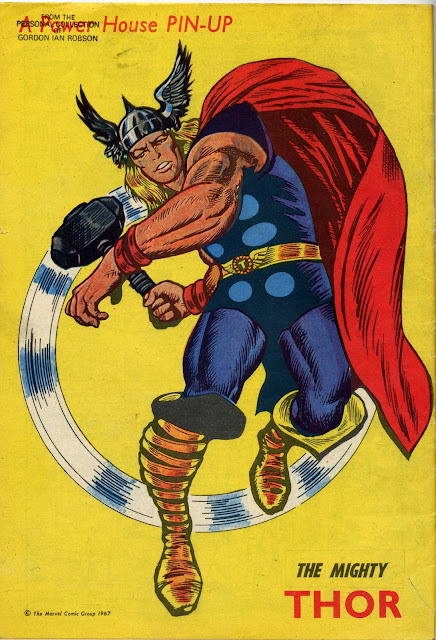 and SMASH!. Each baby made a perfect foil for one another. To date, Shiela and I have created, written and drawn many original comic strips. At the same time, we have been called upon to write and 'ghost' many others. In 1968, we scripted and drew GRIMLY FEENDISH and PERCY'S PETS for SMASH!. At the time, these strips were being drawn (also 'ghosted') weekly by STAN McMURTY, one of our favourite and most respected cartoonists. 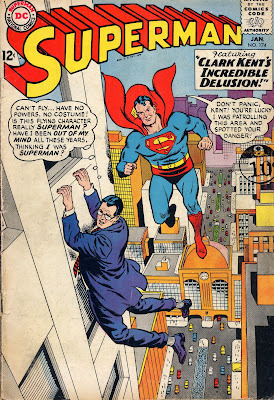 In November of 1969, we got another wonderful break. 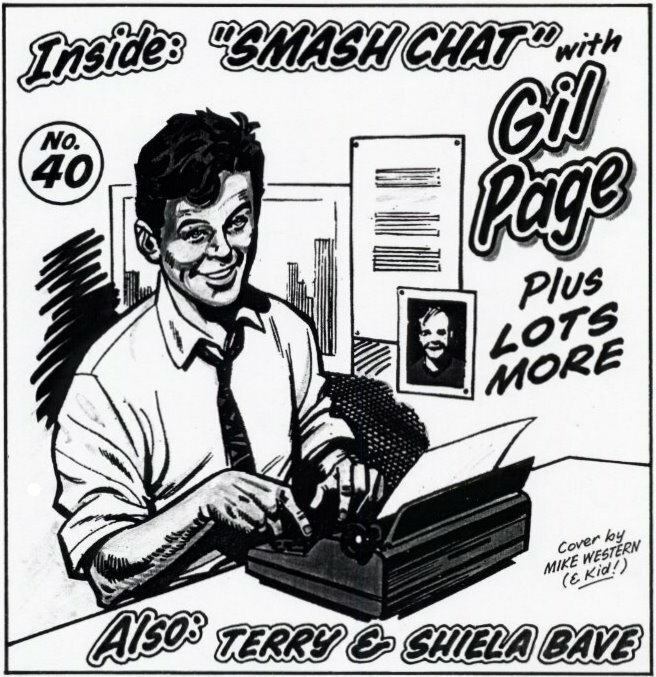 GIL PAGE, then Editor of the 'new' SMASH!, invited us to contribute to the 1971 SMASH! FUN BOOK, a 96 pager full of favourite fun characters. WHAM!, SMASH!, and POW! were owned by ODHAMS PRESS, then IPC/FLEETWAY took over, continuing to run SMASH! in a 'revamped' form for a little while longer. But not before I had added EAGLE EYE, DANNY DARE, The DOLLS Of St. DOMINICS and WEE WILLIE HAGGIS to my 'ghosted' list. Over the following years, I 'ghosted', amongst others, SWEET TOOTH in WHIZZER & CHIPS, HIRE-A-HORROR and VAL'S VANISHING CREAM in COR! !, The KATTS, JELLY BABY and TOFFEE NOSE in KNOCKOUT, and SHIVER, SHAKE, SOGGY The SEA MONSTER and DAMSEL In DISTRESS in SHIVER & SHAKE. 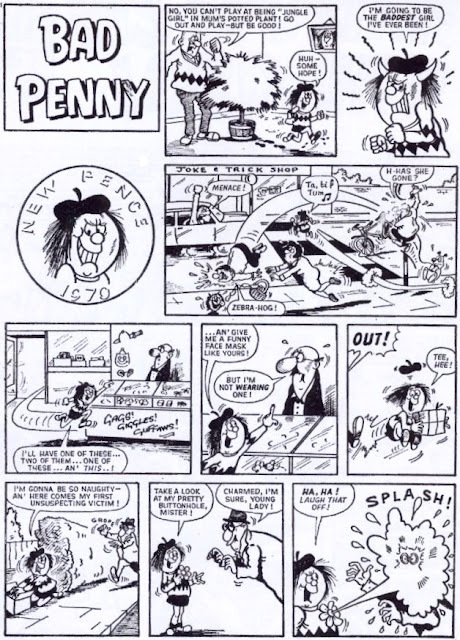 Also SNAP HAPPY and FUN FEAR in WHOOPEE, X-RAY SPECS, MUMMY'S BOY, GUMS, and ART'S GALLERY in MONSTER FUN, RITCHIE RAGS in JACKPOT, NUMBER 13, BASH STREET KIDS, BILLY WHIZZ, The GERMS and IVY The TERRIBLE in The BEANO and KORKY The CAT in The DANDY. I've even had a go at DESPERATE DAN in the Fun-size DANDY books. A lot of challenging drawing, but what a lot of fun 'ghosting' the work of so many favourite comic artists. 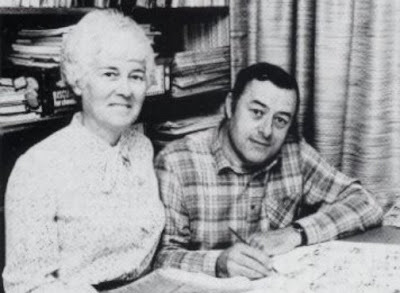 And thanks to Terry and Shiela for all the years of hard work they put into making a lot of happy childhood memories for millions of readers. Please note that this was originally the second instalment of a two-part article, but both parts have now been combined on this page. However, part one is still advertised in the 'You might also like:' feature, but no longer exists as a separate post. If you click on it, a link will direct you to this page. Part two is also still advertised separately, but is now the complete article which you have just read and hopefully enjoyed. WHO IS THE MAN... THE MAN CALLED FLINTSTONE? 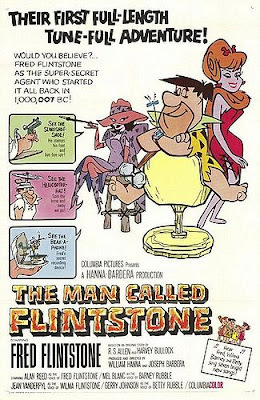 In the latter half of 1972, my local cinema (the first purpose-built cinema in the U.K. since the war, with the largest screen in Scotland) was showing a double bill of LIVING FREE (the sequel to BORN FREE), and - wait for it - The MAN Called FLINTSTONE. 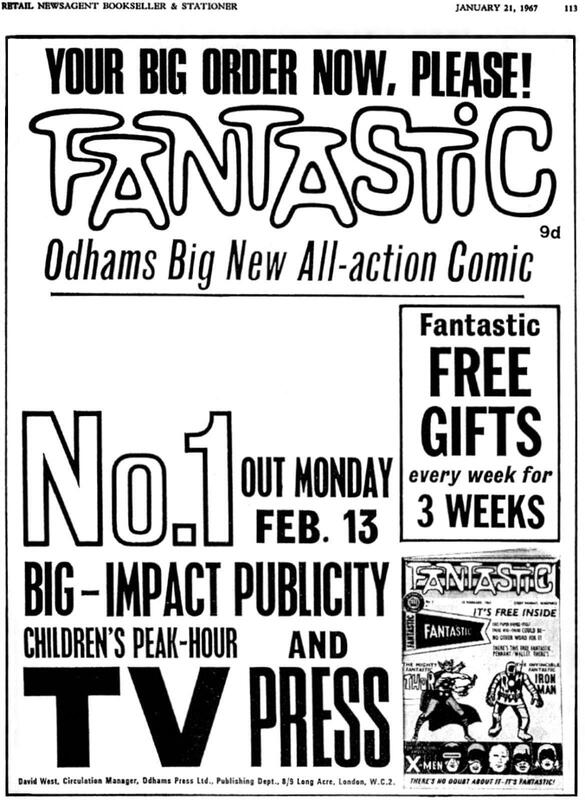 Back then, the programme probably ran about a fortnight before being changed﻿, and, one day, having nothing better to do, I wandered in to see it. 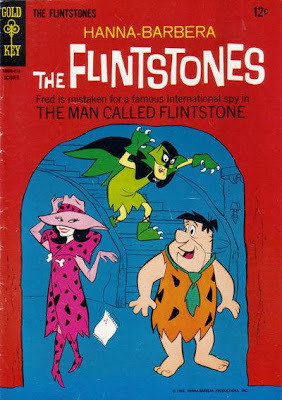 I was instantly enthralled by the exploits of FLINTSTONE... FRED FLINTSTONE, as he filled in for incapacitated secret agent ROCK SLAG on account of being his spittin' image. Right from the very beginning, the audience knows that this is going to be something different to the TV show. There stands WILMA, larger than life, holding aloft the famous COLUMBIA torch; then we're hit with a JAMES BOND style theme song before the film proper begins. And what a film it is! 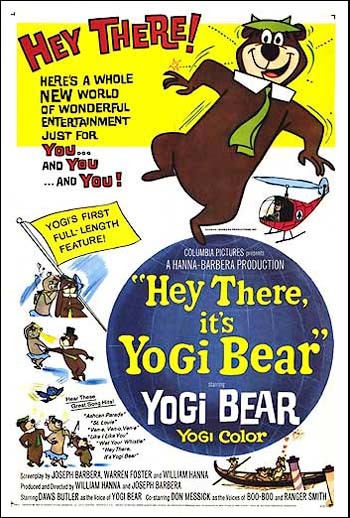 How a cartoon film can have a "big-budget" feel (at least at the beginning) in comparison to a TV episode, I'm not sure - but this movie (released in 1966 following the TV show's final season) certainly creates a whole new dimension and is well-worth seeing. 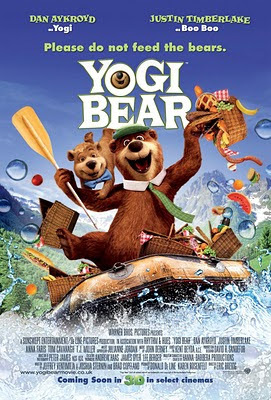 Over the course of the remainder of the movie's run, I went back several times, not even bothering with the live-action film which preceded it. Indeed, on one occasion when I took along a friend, he got in for free as a reward for my frequent attendances. (Some complimentary popcorn and Cokes would've been nice, but I guess you can't have everything.) Thanks to the late Mr. BOB JOHNSTONE, manager of The CINEMA (as it was imaginatively known) for its nearly 20 year run. That first purpose-built cinema in the U.K. since the war (with the largest screen in Scotland, remember) is now a bingo hall - but, somehow, magically, I'm back there in its glory days whenever I watch this highly amusing and entertaining film. 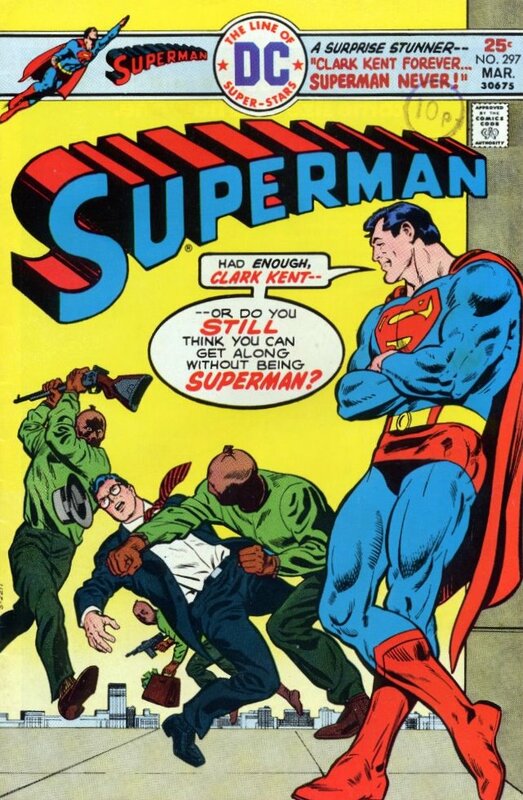 of the covers are symbolic, but they're clearly designed.to "hoodwink"
the decades since Superman first appeared in all his four-colour glory. them, and enlarged further by clicking on them again. 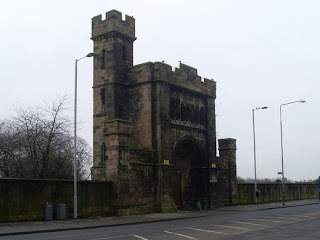 "Glasgow's Southern Necropolis is an eerie place at the best of times, but when two local policemen answered a call there in September 1954 they encountered a bizarre sight. Hundreds of local children, ranging in ages from 4 to 14, were crammed inside, roaming between the crypts. 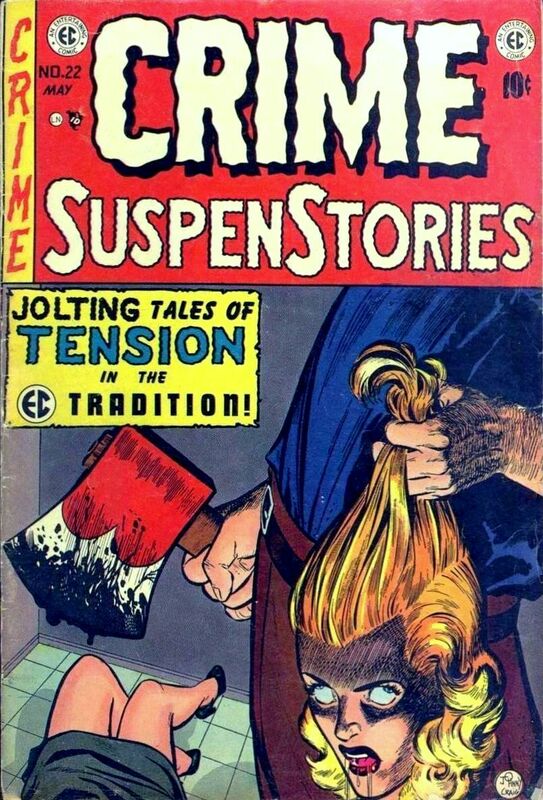 They were armed with sharpened sticks, knives stolen from home and stakes. 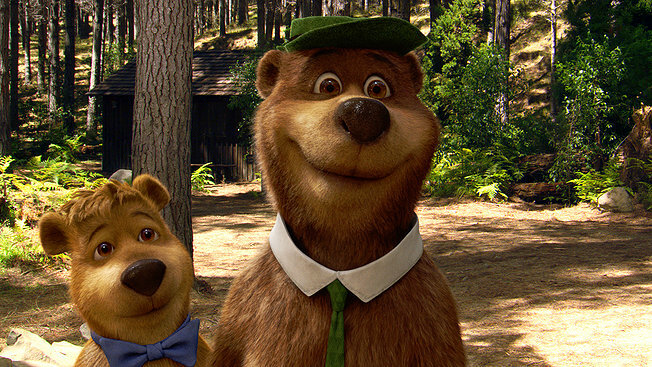 They said they were hunting down "A Vampire with Iron Teeth" that had kidnapped and eaten two local boys. 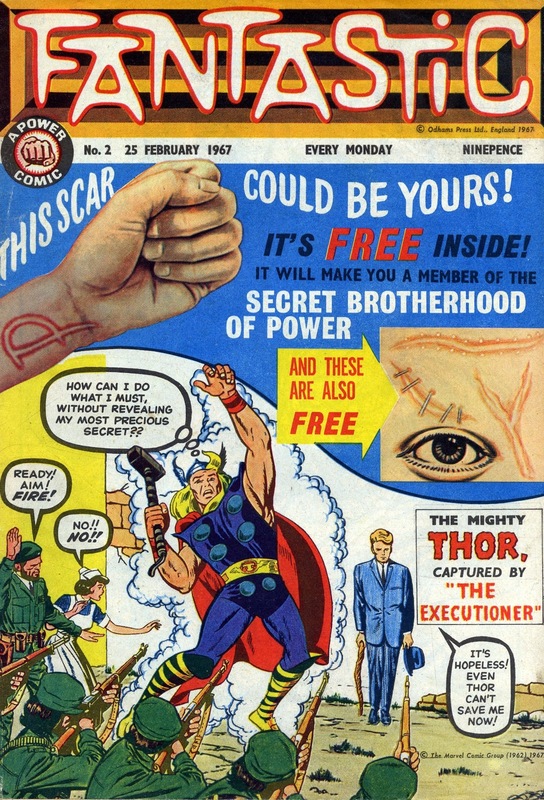 The British Press raged against the "terrifying, corrupt," comics and after a heated debate in the House of Commons where the case of the Gorbals Vampire was cited, Britain passed the Children and Young Persons (Harmful Publications) Act 1955 which, for the first time, specifically banned the sale of magazines and comics portraying "incidents of a repulsive or horrible nature" to minors. 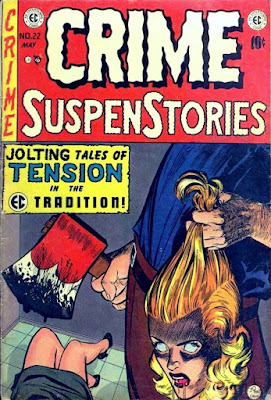 Writer Louise Welsh explores how the Gorbals Vampire helped bring the censorship of comic books onto the statute books." However, it amazes me that those folk (who are perfectly entitled to their view) don't seem to find anything to be concerned about on the matter of hundreds of children armed with sticks, knives and stakes, roaming a graveyard in the early hours of the morning over a period of three days, looking for a vampire (or reasonable facsimile) to impale. Had they come across someone even vaguely strange looking, the results could have been catastrophic. So what does the episode prove, if anything? 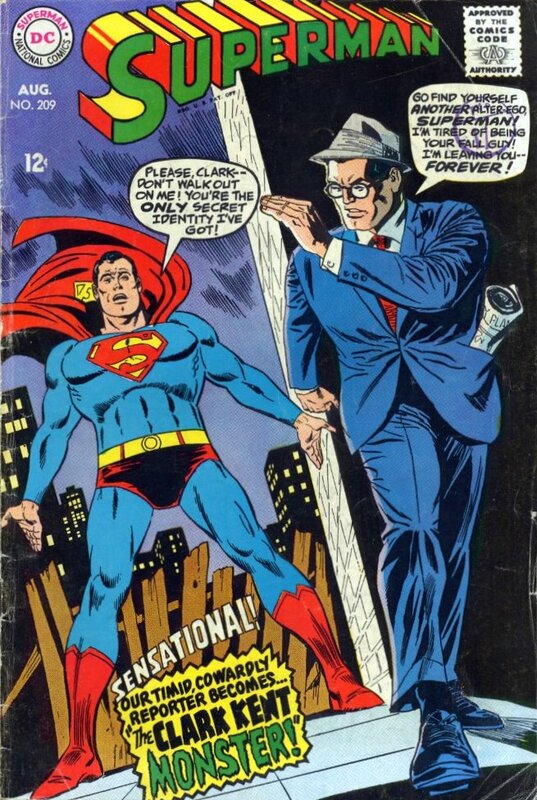 That comics can corrupt? No, although the subject is deserving of further investigation. What it most certainly does seem to prove, however, whatever the source of the "hysteria" on those October and November nights all those years ago, is just how impressionable and susceptible to suggestion children can be. That being the case, surely there's something to be said for exercising a little caution in what we allow them to be exposed to? Something that all those smug, pompous, self-satisfied types with a vested interest in producing (or purchasing) anything they want under the excuse of "artistic expression and creative freedom" should bear in mind. Mattel's Man In Space - but how does he go to the toilet? 1969's "giant leap for mankind" was still two years in the future when one of America's leading toy manufacturers, MATTEL, released MAJOR MATT MASON and his space-age buddies in 1967. (The copyright date was 1966, but the toys didn't appear in shops 'til the following year.) There was CALLISTO (from Jupiter), SERGEANT STORM, DOUG DAVIS, LIEUTENANT JEFF LONG and CAPTAIN LAZER, who was a giant plastic figure in contrast to the smaller rubber-and-wire bodies of Matt and his colleagues. 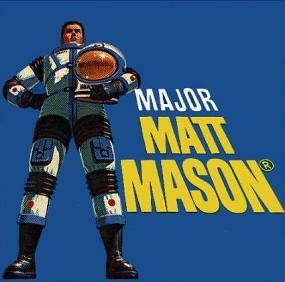 Major Matt Mason was a brilliant toy and also a rubbish one at the same time; brilliant because it looked great and the playtime possibilities seemed unlimited due to the loads of equipment one could purchase for the astronaut. (Moon suits, space stations, etc.) Rubbish because the paint on the rubber bodies started to peel off within hours, and the wire within the figures broke within days. So perishable were they that it's a miracle any of them survived to the present day. 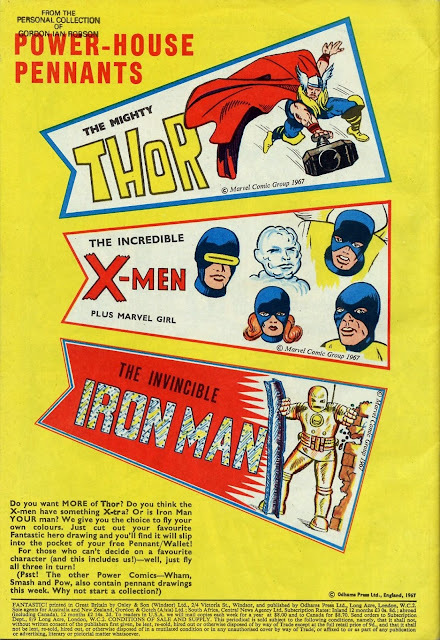 However, in their time, they were the "must-have" toys of the moment, and many a childhood was brightened by its association (short-lived as it may have been) with the first man on the moon - in Mattel's universe at least. Apparently, TOM HANKS is to star in an upcoming MAJOR MATT MASON movie. Perhaps we'll soon see Matt and all his buddies gracing toy shop shelves once more. Now wouldn't that be something? the paltry amount of £1.50. home - and Batman made the return journey with us. The U.S. version of the box. U.K.
almost to the very month. H'mm - just me then. ANYONE REMEMBER FRY'S 5 CENTRE? AZTEC BAR, SUPER MOUSSE, FRY'S 5 BOYS, JUNGLIES JELLIES, CRESTA, ZING, MB BAR, SPANGLES, BAR SIX, AMAZIN' RAISIN BAR - those are just a few of the delights of yesterday which are no longer with us. One of my favourites was FRY'S 5 CENTRE, which was the same idea as FRY'S CREAM (which is still with us) but containing five fondant cream flavours in each bar as opposed to just one. 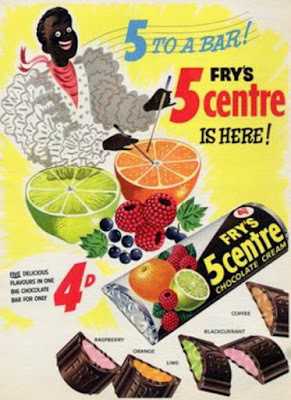 Fry's 5 Centre probably had a few wrapper designs in its lifetime, but the one I remember best is the one from the '60s. Every Sunday night at eight o'clock precisely, my brother and myself would each be allowed to pick two bars of chocolate (one to eat there and then, one to be kept for school on Monday) from the stash kept in the small brass box at the side of my Grandpa's chair. (Sunday being not only the day of rest, but also the day we visited my Grandparents, you see.) Invariably, Fry's 5 Centre would be one of my choices. If you're around the same age as myself, the above images will bring back hopefully happy memories from your youth. Look at that wrapper - you can almost taste that chocolate and its delicious five-flavour fondant filling, can't you? Yummmmm! Every person's mind has its own time machine - all it requires is the right image to operate the controls and return you to an earlier age. format - albeit in a slightly larger size and in black and white. 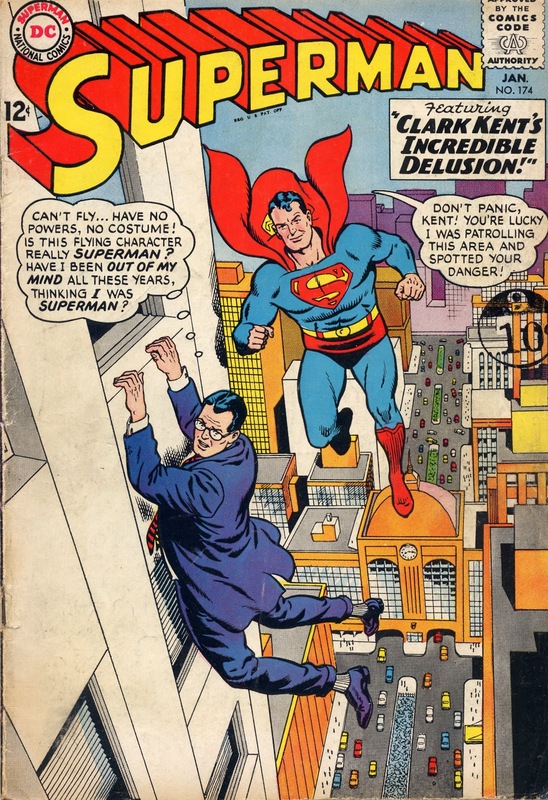 and speech patterns were routinely changed ("I ain't" to "I'm not"
LEE, LARRY LIEBER and ROY THOMAS. 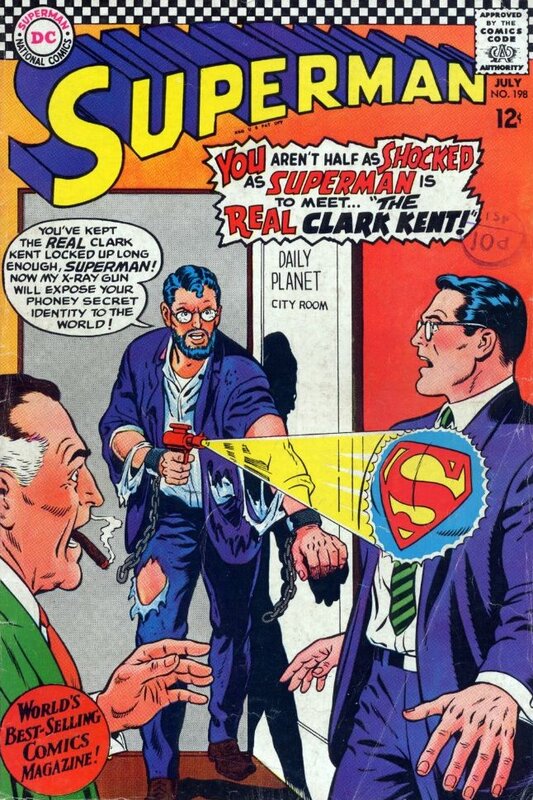 throughout its entire run by Spanish artist LUIS BERMEJO. the comic to alert newsagent's to its upcoming launch.